The law offices of Keating Muething & Klekamp are located in the Business District in Downtown Cincinnati, at the corner of East Fourth Street and Vine Street. Our receptionist is on the 14th Floor of our building. Parking is available at Olympic Auto Park on Vine Street, between East Third and East Fourth Streets; other options for parking include Mabley Place Garage located at Fourth and Race Streets (42 W. Fourth Street) and at Fountain Square Garage located at Fifth and Vine Streets (520 Vine Street). 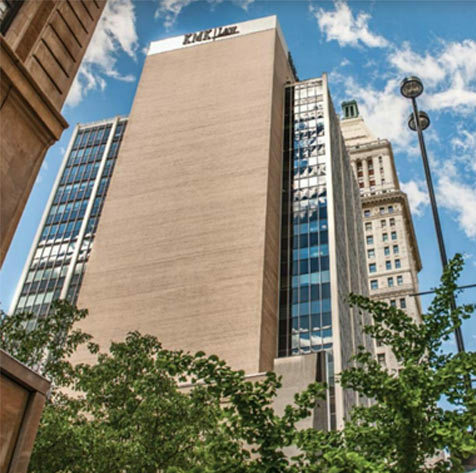 KMK's offices are a block from the historic Fountain Square, Carew Tower, and a number of hotels, restaurants, and retail shops. We are also an easy walk to the Great American Ball Park (home of the Cincinnati Reds baseball team), Paul Brown Stadium (home of the Cincinnati Bengals football team), the National Underground Railroad Freedom Center, and other renowned cultural institutions. For the latest news from and about Cincinnati, see The Cincinnati Enquirer (daily newspaper), the Business Courier of Cincinnati (weekly business news), and soapboxmedia.com (weekly electronic business features and news). For additional information on visiting Cincinnati, please see the Cincinnati USA Regional Tourism Network web site. Also, Procter & Gamble has a detailed website for visitors and those considering a move to Cincinnati. KMK's Office at One East Fourth Street is located at the corner of East Fourth Street and Vine Street. Several hotels are located within walking distance or a short drive to KMK's offices. Cross over the Brent Spence Bridge and take the Second Street exit. Turn left on Vine Street. Just beyond the first traffic light (Third and Vine), on the right, is Olympic Auto Park. Park on the top level, entrance just before Ogden Alley. Walk north on Vine Street. Turn right on Fourth Street. Enter the revolving doors beyond the bank entrance, and take the elevator to the 14th Floor. Take the Second Street exit. Turn left on Vine Street. Just beyond the first traffic light (Third and Vine), on the right, is Olympic Auto Park. Park on the top level, entrance just before Ogden Alley. Walk north on Vine Street. Turn right on Fourth Street. Enter the revolving doors beyond the bank entrance, and take the elevator to the 14th Floor. Take I-275 East, then exit onto I-75/I-71 North. Cross over the Brent Spence Bridge and take the Second Street exit. Turn left on Vine Street. Just beyond the first traffic light (Third and Vine), on the right, is Olympic Auto Park. Park on the top level, entrance just before Ogden Alley. Walk north on Vine Street. Turn right on Fourth Street. Enter the revolving doors beyond the bank entrance, and take the elevator to the 14th Floor. Take the Downtown/Third Street exit. Turn right on Vine Street. Immediately to the right, you will see Olympic Auto Park. Park on the top level, entrance just before Ogden Alley. Turn right on Fourth Street. Enter the revolving doors beyond the bank entrance, and take the elevator to the 14th Floor. Cross over the Daniel Carter Beard "Big Mac" Bridge and take the Sixth Street exit. Turn left on Walnut Street. When you come to Third Street, turn right. At the next intersection, Third and Vine, turn right. Immediately to the right, you will see Olympic Auto Park. Park on the top level, entrance just before Ogden Alley. Turn right on Fourth Street. Enter the revolving doors beyond the bank entrance, and take the elevator to the 14th Floor.